Combines reliable power with a compact, robust design. Clean, Quiet, Efficient: DI technology uses injectors to spray diesel fuel atomized at 26,000 psi directly into the main combustion chamber of each cylinder. 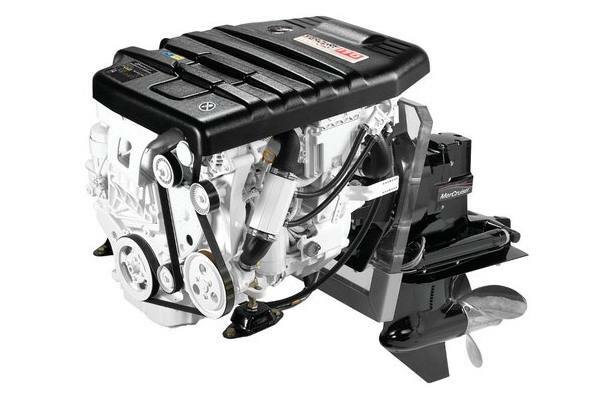 This process optimizes fuel efficiency and minimizes emissions, along with engine Noise, Vibration and Harshness (NVH) for an enjoyable boating experience. Power & Performance: The low weight of these diesels results in best-in-class power-to-weight ratio. Combined with great low-end torque, the end result is crowd-pleasing hole shot, great acceleration, low planing times and ultra-smooth performance. Intuitive Design: Mercury® SmartCraft® compatibility is built into these engines, delivering key information about vital engine functions on an easy-to-read LED display. SmartCraft Digital Throttle & Shift (DTS) offers smooth shifting, immediate throttle response and high-tech digital controls. Corrosion-Resistance: Mercury diesels feature state-of-the-art anti-corrosion, including a thermostatically controlled closed water-cooled system. Water-cooled engine oil, gear oil and steering fluid decrease engine-room temperatures, extending engine life. The SeaCore® system is available for the ultimate in saltwater protection.